We will be back in 2016 for two weeks again, or maybe the month. We really enjoyed our stay! They were always pleasant and knowledgeable. We arrived when they were just leaving and they booted up the computer and pleasantly took care of us. If only we could bring our two little 9 lb. dogs, it would be perfect! We are looking into property for next year so we can bring them and we could stay longer. The property was beautifully maintained--inside and out. Separate pools & hot tubs to accommodate each building is a big plus. 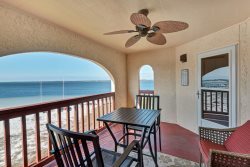 Fantastic ocean views, well-maintained beach walkways, convenient trash chutes on each floor & lots of outdoor sand cleaning facilities.